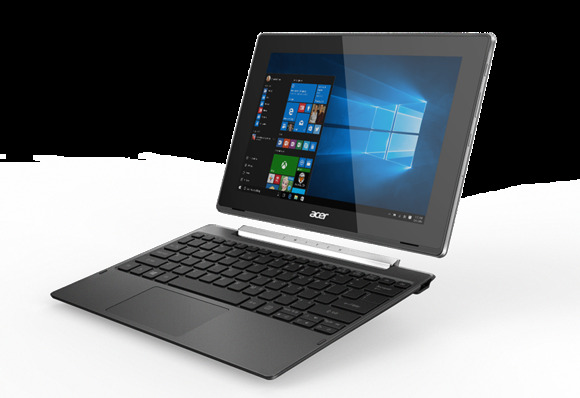 Windows 10 PC prices have been slowly creeping up, but some new back-to-school Switch tablet/laptop hybrid devices from Acer may be attractive to those on a shoestring budget. The US$199 Switch One 10 is one of a few touchscreen hybrids priced under $200. Acer also announced the Switch V 10, which starts at $249 with additional features including a USB-Type C port, a fingerprint reader, 802.11ac Wi-Fi and a Gorilla Glass screen. The hybrids, also known as 2-in-1 devices, are 10-inch tablets that can be latched on to a keyboard dock to become a laptop. The new Switch devices are inexpensive Windows alternatives to Chromebooks, which are laptops with Google’s Chrome OS. Acer sells Chromebooks starting at $179.99. Windows PC prices have been going up recently, but Chromebooks have remained inexpensive because of basic storage, memory and processors. Google has been promoting Chrome OS—which is mainly for web-based computing—as a Windows alternative. Microsoft has waged an on-and-off battle with Google by encouraging PC makers to develop low-cost Windows PCs with OS subsidies. PCs with Windows 8.1 with Bing were available for under $200 starting in 2014, but those laptops were phased out with the release of Windows 10 last year. Acer’s 2-in-1s have Intel’s “Cherry Trail” Atom chips. Intel is phasing out Cherry Trail over time in favor of new Pentium and Celeron chips code-named Apollo Lake, which will become available later this year. Exact specifications for the 2-in-1 devices weren’t immediately available, but low-priced laptops usually have flash storage up to 64GB and under 4GB of RAM. The hybrids will be available in the U.S. and Europe in July, and in China in September. Acer also announced new laptops: the TravelMate P249 with a 14-inch screen, and the P259 with 15.6-inch screen. The laptops can be configured with Intel Skylake chips, Nvidia’s GeForce 940M GPUs and up to 32GB of DDR4 memory. The laptops start at $599 and will ship in Europe, the Middle East, Africa and China in August, and the U.S. in the fourth quarter. The PCs were announced ahead of the Computex trade show next week in Taipei.